This intimate portrait of Jordan offers nuance and subtlety by dint of interviewees drawn from across the spectrum of society. 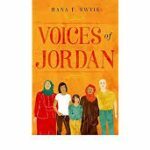 This book tells the story of Jordan through the lives of ordinary people, including a political cartoonist, a Syrian refugee, a Jihadist and a female parliamentarian. The raw voices and everyday struggles of these people shine a fresh light on the politics, religion, and society of a culture coming to terms with the harsh reality of modernisation and urbanisation at a time of regional upheaval. Copies of Voices of Jordan will be available on the day for a reduced price of £15(RRP £18.99). Where: Boardroom, The Arab British Centre, 1 Gough Square, London EC4A 3DE. RSVP is essential. Please confirm your attendance with Joseph Willits (willitsj@caabu.org).